On 2 November, 1944, B-24’s of the 489th BG were sent to destroy the railroad marshalling yards at Bielefeld Germany. The Liberators were met by the new German jet fighters, the Messerschmitt Me-262. It is believed to be one of the earliest jet attacks against U.S. heavy bombers. This was the 489th's first encounter with the Me-262, although rumors had been circulating through the squadrons during the preceding weeks about the strange new German aircraft. As "R-Bar" was leading the high element off the bombing run, pilots and crew could see some aircraft circling in a lazy eight pattern high above and in front of them . Suddenly, as if on cue, the jets, believed to be from III/ EJG 2 based at Lechfeld, came diving down through the bombers with blinding speed. The jets were only able to complete one firing pass before they were chased off by P-47 Thunderbolts that were escorting the bombers. The high rate of closing speed in a head on attack had made it almost impossible for the new jets to hit anything. The frontal attack was soon discarded by the Luftwaffe and a rear attack tactic was adopted which gave the jets more time to acquire a target and fire their guns and rockets. 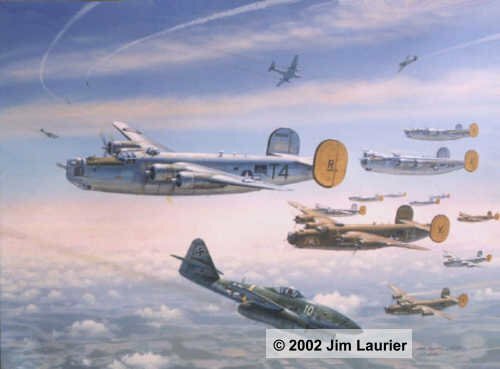 In the brief encounter depicted in "R-Bar Over Bielefeld", one B-24 has an engine that is smoking due to flak damage which occurred previously while on the bomb run, however all aircraft made it home safely on this day with no losses on either side.